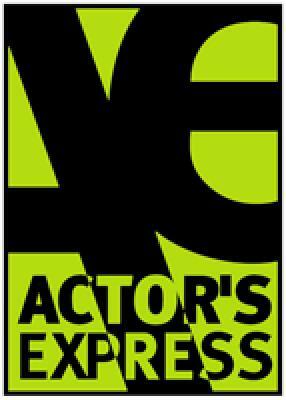 Actor’s Express is advertising its new "Company" as "a modern makeover." What that means is that it is using the script from a recent revival and that Bobby listens to voice mail on a cell phone. Otherwise, it’s the same script and songs that have been around for years (with "Tick-Tock" omitted and "Marry Me a Little" interpolated). Seamus M. Bourne’s scenic design clads three sides of the playing space with window-like panels, through the assistance of André C. Allen’s lighting design. The thrust space has a couple of lounging sofas closest to the audience, backed by a series of elegant wood platforms and an industrial steel-and-wood staircase and platform. A couple of Lucite chairs upstage provide the only seating on the set proper. The set and lighting are simple and elegant, not drawing undue attention to themselves, but enhancing the production. Costumes, designed by Deyah Brenner, do not enhance the production. There’s a preponderance of black to begin with, I suppose to suggest elegance, but none of the black dresses or the subsequent costume pieces really flatter any of the actresses. Men are in pretty generic suits throughout. Angie Bryant’s sound design gets the sound balance right, but that doesn’t mean the show sounds good throughout. At the performance I attended, there was wincingly sour flute accompaniment early on. I saw the musician fiddling with the flute during an interlude, and afterwards it was more in tune. But the musicians are visible at the back of the playing space, and their facial expressions are of complete disinterest, verging on sullenness. Music director/pianist Alli Lingenfelter sets aggressively quick tempos for the up-tempo numbers and lets the ballads slip into indulgent rubato. The cast is competent, with no real standouts throughout, although many solos (like "Getting Married Today" and "Ladies Who Lunch") garner significant audience applause. Daniel Burns and Jill Hames make for a very pleasant Peter and Susan. Both have lovely voices. Craig Waldrip and Rhyn Saver have equally fine voices as Harry and Sarah, but the fight choreography supplied for them by David Sterritt hardly impresses. Laura Floyd and Phillip Lynch add wonderful voices and fine acting to the mix as Jenny and David. Dan Ford and Jessica Miesel are a bit physically mismatched as Paul and Amy, both giving fine performances, although Ms. Miesel sometimes turns her charm off when carrying a cake, turning it back on when she gets into position and realizes she needs to be in character. Libbey Whittemore excels in her role as Joanne, but flubbed a musical entrance at the performance I saw. I did not see Steve Hudson in his role as Joanne’s husband Larry, and his understudy appeared nervous, especially in the first act. Lowrey Brown does not play Bobby as a particularly charismatic bachelor, which leaves a hole at the center of the show. The show consists largely of a number of vignettes involving the various married couples in Bobby’s social circle, and Mr. Brown seems to be playing a different character in each. There’s not enough core commonality in the Bobby we see to make him a character worth caring much about. Three of Bobby’s girlfriends also appear in the show. Jimmica Collins and Emily Stembridge are weak as Marta and Kathy. Kelly Chapin Martin puts much more into her April, scoring in most moments. Director Freddie Ashley has chosen to block the "Barcelona" scene in a static fashion, however, meaning that half the audience can’t see much of her face for long stretches of time. You know there are blocking problems when half the audience erupts in laughter at something the other half of the audience can’t see, and consequently doesn’t respond to.